This is the story of how Blake chose to enter into the world on August 22nd at 12:50 pm. I begin at the beginning of my pregnancy so that others will see the journey my husband and I went on. How the choices we made and did not make effected us. I hope that other women will learn from my experience to listen to their inner self. I was blessed that I ended up with the birth that I desired (even though it was not planned this way) but for many others I know that this does not happen. They settle for something less than what they desire. I want other women to know that they are powerful, strong, and know how to follow the best choices for themselves no matter what others think or say. Blake’s story begins in December 2009, when I found that we were pregnant. This after a few years of not preventing it. I soon found that there were many decisions about the care we wanted to receive and how we wanted Blake to enter into the world. I met with Julie Byers, a doula, to discuss options. 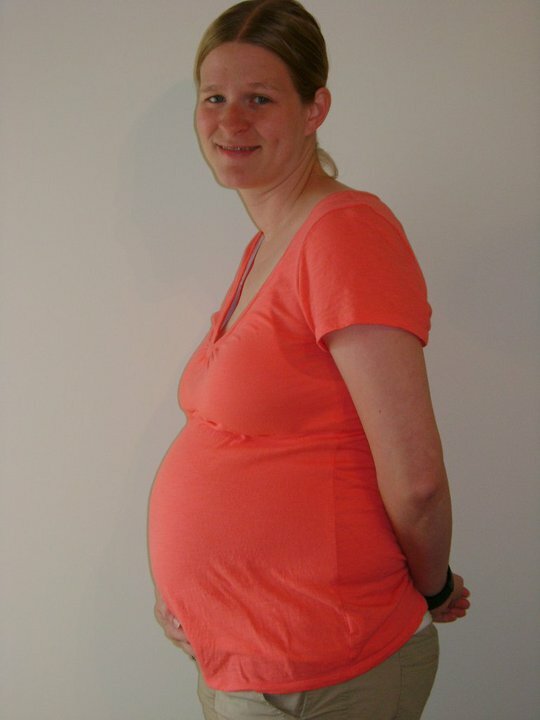 Before meeting with Julie, I had joined the AnMed practice in order to start receiving the prenatal care I needed. I met with Julie at Spill the Beans in Clemson and we began to discuss what I wanted, felt I needed for my care, and what I wanted in a birth. Speaking with Julie and having her listen to me “ramble on” allowed me to realized the kind of care I wanted and the type of birth I wanted. She suggested that I speak with her friend Carey Collins who is a midwife and learn more about homebirths. We then started to look at birthing at Oconee. That way we would be closer to home. We set up a tour of their birthing floor and was impressed with the attention, the one-on-one time the floor’s supervisor spent with us, and the answers we were given to the questions we had. We then asked for recommendations of doctors who delivered there. We were given names. I soon made an appointment and switched care providers. Still unsure of what kind of birth I wanted I decided in April that I would meet with Carey. By the time this meeting came to pass I had done much research on home births and discussed home birth with many different individuals. All with their own opinion of whether it was safe, appropriate, and all with their own opinion of what I should do. Brandon and I knew we wanted a home birth deep inside but we wanted to please those around us, so I discussed with Carey the possibility of her being our monitrice and laboring as much as possible at home and then going to the hospital to deliver. After meeting with Carey, and discussing the options, I decided that laboring at home and birthing at the hospital would make everyone happy. (Did I put much stock into how I felt about this? If you asked me then I would say yes. If you ask me today I would say I was the only person I did not listen to.) From this meeting with Carey, I loved the bond that quickly formed between the two of us and the knowledge she provided into understanding how I was feeling and the knowledge she had of birth itself. We decided that day to work with Carey, a decision I will never regret! We soon went for our first visit with our new care provider and were impressed with the time she spent with us discussing our pregnancy. We were happy with our care until a visit in June when I went one time by myself and gave the doctor my birth plan. As I sat with her in the office the doctor began to write on my birth plan and marked out parts of my plan. Asking me questions that were formed in medical lingo that I didn’t understand. I left that day feeling bullied and beat up. At this point, I knew again deep inside that I really wanted a homebirth but I till didn’t listen to my inner self and continued care with this provider. Sunday I woke up with small cramps and a small, tiny, amount of discharge. Nothing that alarmed me or made me think Blake was coming anytime soon. I was busy planning on being at school the next day and seeing my kids for the second week of school. Brandon asked me around 8:45 if I was up to going grocery shopping because the cramps were a little stronger (Let me say here none of the cramps I experienced during my birthing time were anything close to what I have experienced during my period). I told Brandon sure we must continue on with our day. Before we went to Bi-Lo I asked Brandon to take a picture of my belly. We had been meaning to for quite a while because I finally “looked” pregnant. I am so glad we did this. In the back of my mind I think I knew that Blake might be coming in the next few days. At 8:45 we left for Bi-Lo. As we shopped through Bi-Lo I had to stop every now and then because of the cramps and I would “look at the shelf” and made comments jokingly that if these cramps are pressure waves than this is nothing. I also looked at Brandon after one of them and said jokingly “I smile and feel happy after my pressure waves.” This came from one of the Hypnobabies scripts that I had ingrained into my brain. I really could recite many of the scripts by heart. After making these comments Brandon and I would bust out laughing at each other!! We didn’t even consider that those really were pressure waves, I thought my body is just getting started and I had a few more days to prepare. On the way home, I mentioned to Brandon that I thought Blake had dropped because I had a huge gap between him and my ribs. Blake was always in my ribs during the pregnancy. I should have taken this as a clue but since I was not experiencing anything I thought of as “labor” I choose to continue to ignore what I was experiencing and dismissed it. When we returned from the store, I started to have diarrhea on top of the cramps. I asked Brandon to call Carey just to ask if this was normal. This was around 10:00. Carey reassured both of us that all was normal. This was the normal way for the body to get ready for the birth that was to come and it could be another couple of days. She reminded us just to continue with our normal routine and ignore it. After speaking with Carey, we decided to watch a movie that we had rented the night before. I tried laying down and watching but the cramps were uncomfortable and I kept having to go the bathroom. This continued for a while. I would lay down to watch the movie, watch about minute or two and then I would be up and going to the bathroom. I soon claimed the toilet as my throne. During my time on the throne, Brandon was busy gathering items for the hospital. Later I asked him if he knew it was going to happen and he said he thought he should be ready in case. After being on my throne for a while, I found some comfort on the birthing ball by bouncing up and down and rolling my hips back and forth while sitting on it. I told Brandon just to turn the movie off because I couldn’t remember what was happening during each time I cam back from the bathroom. The comfort from sitting on the birthing ball only lasted a few minutes and it was back to my throne in the bathroom, where I felt most comfortable. Again I should have started putting the signs together because Julie told us in the class most women spend lots of time on the toilet during their pressure waves because it is most comfortable. I still didn’t realize what was going on because I was waiting on the “labor pains” that many women speak of. I was only having pressure and they were not even like the Braxton Hicks I had experienced in the months and weeks before. This time I called for Brandon to come to the bathroom because every time I tried to use the bathroom I now felt as if I was going to throw up as well. Brandon’s job became to hold the trashcan and allow me to lean over his arm that he held in front of me during the cramps and sensations of pressure. During these moments he spoke words of affirmation and words of comfort that he learned in our Hypnobabies class. He helped me to relax and remember that my body knew what it was doing and that my body was made for this. Soon I began to move back and forth between the floor and my throne. I asked Brandon to call Carey and tell her to head this way because I no longer felt comfortable being without her. I needed her reassurance that everything was normal. At this point we still did not know that Blake would be entering the world in a few minutes. Brandon only left for a moment to call her around 12:26 when I felt an explosion come out of me and I hollered for Brandon to come back to me. Brandon had just enough time to call and ask her to “head this way”. We joked that Carey probably thought “Great, first time parents I will be there all day because they still have a few days”. We learned later that Carey could tell from listening to Brandon’s urgent plea that something was happening and not once did she think that. When Brandon got back in the room I asked him to check and see if he could tell what the explosion had been. He checked but couldn’t tell or see anything. He continued to comfort me in the best ways he could. Reassuring me and loving on me during each of the times I felt pressure. After being on the throne for a few minutes I then felt the need to move back to the floor. This is where I felt the most comfort while I experienced the pressure waves from where Blake was at inside of me. I still didn’t realize at this point what was happening. I was waiting for the intense pain of labor that I grew up hearing about. When Brandon got me to the floor I began to push as if I was using the bathroom. My body wanted me to push and so I did. It was the only comfort to the pressure I was feeling and as I pushed I thought that I felt something coming out. Yet again I felt below and this time I thought I felt hair. Brandon at this point saw Blake’s head and hair. He said it would peek out and then go back in. I really thought I felt it too but Brandon told me it was “nothing, don’t worry about it” when I asked him what it was. Later we laughed about this and how he choose to tell me a little white lie. He said he told me it was nothing because he was doing his best to keep me from freaking out. My husband knows me well because we were all by ourselves and Blake was on his way and had I realized this I probably would have freaked out. At this point I don’t remember much because of the way my mind and body were working together. Brandon said very quickly Blake’s head peeked back out and that he told me not to push. Then Blake’s head come all the way out and Brandon told me to give a little push. Brandon was able to see Blake turn as he slid all the way out at 12:50. This was something Brandon was expecting because during our hypno class we saw images that showed how the baby turns in order to leave the body. 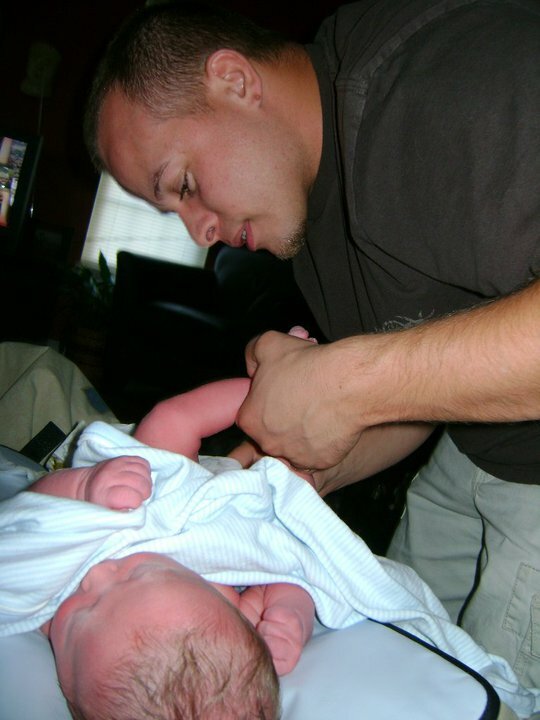 When Blake came out, Brandon quickly laid him on my chest and covered him with a towel. I was in shock and kept asking Brandon if it was a dream and if Blake was really here. I then kept shouting at him what time is it, what time is it. I wanted to know the time of our precious baby’s birth. Brandon called Carey back to tell her Blake had arrived (it had only been 24 minutes since our last call to Carey to head this way) and she to could not believe that Blake was already here. She was still 15-20 minutes away from the house. During this time on the phone Carey assured Brandon that everything was fine. However Brandon had a hard time hearing her because I was so consumed with excitement and joy (meaning I was loud). Brandon handed me the phone and said “Carey wants to talk to you”. Carey quickly got me calmed down as I began to experience the euphoria of holding my son that my husband caught and gazing into my son’s eyes. I still had a hard time believing that this was not just a pregnancy dream. Brandon propped me up and continued to speak words of love and told me how impressed and in awe he was of what I had just done. I in turn told him how proud of him I was for catching our son! Did I mentioned that smoke detector went off and Blake christened me while we were cuddling on the floor all before Carey arrived. Carey came in the bathroom and checked Blake and I over and began to step into action. She helped me to birth the placenta and showed Brandon and I the ‘tree of life’ that is on it. I wish I had Brandon take a picture. She also helped me to nurse Blake for the first time on my chest while he was still attached to his umbilical chord. She checked over Blake and I before moving us to the bed. While I was in the bed coming down from the adrenaline, Carey clamped and cut the chord and she had Brandon cook me some eggs and toast. Carey began to feed me and Brandon said I kept falling asleep between bites. While Carey was looking after me, Blake was being held by his father. After eating, Carey put Blake in the bed with me and helped me to nurse again. Then Brandon weighed and helped measure Blake. He was 7lbs 9oz and 21 inches long. Soon Brandon crawled into the bed and spent time with me and Blake while Carey cleaned up the bathroom and started a load of towels in the wash. At this point no one but Carey, Brandon, and I knew Blake was here. It was wonderful to enjoy our son in the peace and quiet of our own home, in our own bed, in our own way. Carey respected us and our wishes in a way I will never forget. That is the story of how Blake chose to enter into the world on August 22nd at 12:50 pm. Again let me remind you that I begin at the beginning of my pregnancy so that others will see the journey my husband and I went on. How the choices we made and did not make effected us and our child. All I can say after wiping the tears from my eyes is PRAISE GOD!! WOW!! AMAZING STORY!! Very Touching. Thanks for sharing. Wow! How awesome! What a great birthing story. Oh Jenni!! Your experience is so touching and inspiring. And Julie, you must be so thrilled to have such a wonderful testimonial from such amazing first time parents! Bravo mama and daddy! Hooray for a beautiful birth!!! So glad you had the birth that you knew you wanted. I love the quote from your MIL – that sums it all up. Jenni and Brandon, I am so happy for you guys! Praise God for Blake’s arrival! What an amazing birth story, makes me wish I had practiced my hypno scripts a little more! Jenni & Brandon – way to go! Your story has been circulating throughout the Upstate and we couldn’t be more excited for you three and more thankful to the LORD for this incredible gift. Brandon, I must say, after reading this story – YOU WERE AN INCREDIBLE BIRTH PARTNER for Jenni! What an awesome birth story. You knew what you wanted and Blake helped you get it. Great job on dad’s side keeping you relaxed, calm and comfortable. My second son’s birth story was similar in the fact that my midwife did not make it in time for Nicholas’ birth. It is an awesome feeling of it just being you, your husband and your baby in a room. The feeling of empowerment is amazing. Thanks for sharing your story. It will inspire a lot of others to trust listen to themselves and trust their instinct. What a beautiful birth story. The way she describes the pressure waves is the same way my client described hers, just pressure and nothing more, so she was convinced that she had much longer to go. And as you know, just like, Carey, I missed the birth! 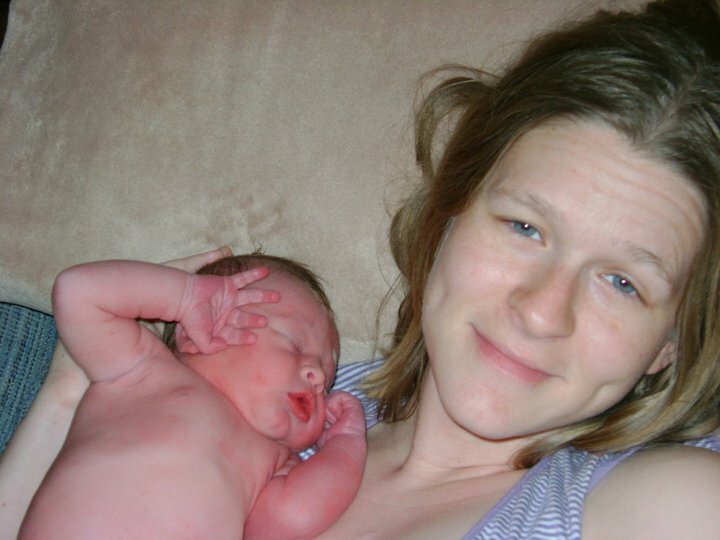 These stories of gentle, calm, quick and easy births are so inspiring to me and ones I love to share with others, so I am very thankful Jenni has shared her story!